Basil's Blog: Hell in a hand basket. A pretty pink hand basket. You've seen the picture of Jesse Thornhill, haven't you? You know, the guy that tried to run over his landlord in Tulsa? Tulsa Police say 28-year-old Jesse Thornhill tried to run down his landlord in his '96 Ford Windstar van Tuesday evening in the 1200 block of South Delaware Place. Yes, he was driving a 1996 Windstar. But that, I can understand. You have to make the most with what you have. He had a Windstar and a landlord that needed running over. What else do you do? Run over your landlord with your Windstar, of course. It's not like he had a fleet of other vehicles. Or, if he did, a Windstar is a better choice than a smart car. A Windstar has many useful features. He could use it for moving bodies, or several body parts. 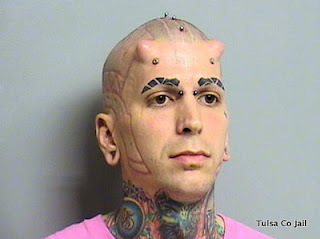 He could transport several other tattooed freaks to the Dairy Queen or to the nearest altar in the woods. You want to make fun of the Windstar, but there could be legitimate uses for a Windstar. What I don't understand, though, is the pink shirt. Having a single vehicle and that vehicle being a '96 Windstar is reasonable. But, seriously? A pink shirt? He didn't have any other shirt? And why would he have a pink shirt? Maybe my prejudice is showing. I don't own a pink shirt. I supported Goldwater in 1964, and no one who supported Goldwater owns a pink shirt. I wasn't old enough to vote for Goldwater, but still, I wanted those over 21 (18 in Georgia and Kentucky) to vote for Goldwater. And I didn't own a pink shirt. Then or now. How can anyone who looks like Jesse Thornhill expect to be taken seriously while wearing a pink shirt? The landlord wasn't injured. Unless he pulled something while laughing at Jesse's shirt. I don't know what this country is coming to. Sparkly vampires, pink-shirted demons, community organizers in the White House. It's like Stephanie Meyer is writing the script. And if we don't get our act together, in the future, people will be reading The Short Second Life of the United States (Obama Saga). I've been wondering where the Okie Prison System will house this dude, if he gets sent to the joint for attempted runnerovering. I'm certain there's not a prison or even a housing unit within a prison that exclusively houses lizardmen in pink t-shirts, although there are specific units who house males who like to wear pink t-shirts. I wonder how the tattoos will look with an orange jumpsuit? I'm sure they'll find a spot for him. And I'm pretty sure the other inmates, particularly the larger ones, will find a use for Jesse. So it'll all work out.